My apologies in advance if I ushered in the End of Days by sleeping until 9:00 on Sunday morning. It was highly out of character for me but it felt really good. That out of routine move set the rest of my Sunday morning on an unusual path. The sky was blue, the temperatures were on their way up towards 55 degrees and there was a light breeze. Normally I would have made time, even if it were just an hour, to swing a leg over the bike and go for a ride. 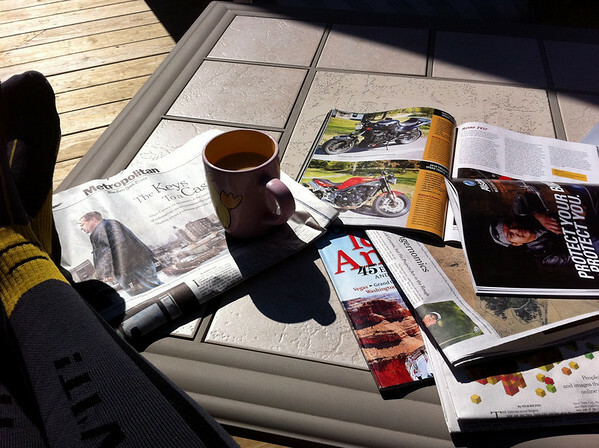 Instead, I firmly planted myself on the deck with coffee, magazines and the paper and just… sat. At this time of year when the weather is starting to turn from the gray of winter to the greens and blues of spring, there is a strange guilt that I feel when I don’t go out for a ride. Maybe guilt isn’t the right word, but it’s something close. Do you ever get that too? I too had that kind of day on Sunday – I thought about riding, on some level I wanted to ride but instead I hung out with hubby and volunteered some time to help out with the local race track’s promotions at the Grande Prairie Sportsman Show. Like you – I felt a guilt like sensation at letting a gorgeous day slip by in that way. It is a rather odd sensation! Well that sounds like a great way to spend the day, anyway. Was it fun? Whoa! 86?! Yea, it really must be something in the air. You’ve been so busy the past few weeks. Sometimes you just need a mental break. This spring has been a really “tired” one for some reason. The time change just about killed me a few weeks back. I was completely wiped out for a solid week afterward. But, I keep telling myself I need to get out and ride to keep my skills and my brain sharp. I find that going for a quick jaunt around town often does wonders for perking me up. I definitely feel guilty when nice weather hits and I don’t go outside. I spent most of my saturday inside between putting a tail light on the DRZ and planning a route for sunday. It felt like I should have took some time and actually went outside and did something but I just didn’t have time. Ha, yes definitely have days like that. Seems like I’ll spend my riding time on grey, cold days. Then when a sunny day comes along, I’ll do everything other than riding. All the time, Fuzz! So far we have three trips out on the F650. Ian has nearly got the Guzzi road worthy again, with its MOT test next weekend. The Suzuki we be up and running at Easter. While Ian is busy I’m catching up on some of the blogs that we follow.